Parthenon: Rise of the Aegean immerses you in an exciting, competitive world filled with aggressive trading, perilous voyages, and the construction of grand monuments. 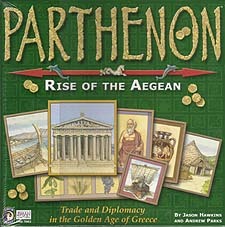 Parthenon is a game of commerce for 3-6 players set in the islands of the Aegean Sea. The time is 600BC and Mainland Greece stands on the threshold of glory. The Aegean Islands now attempt to share in that glory and to thrive in an increasingly profitable (and dangerous!) world. In Parthenon, each player represents a different island in the Aegean Sea, populated by villages. Each islands' villages produce commodities which are either traded with other islands, or sent abroad across the Mediterranean Sea. An island's fleets journey to distant lands and face the deadliest hazards, but also obtain the greatest rewards. Each player strives to develop his island by building additional villages and workshops, as well as fortresses, shrines and academies. The first player to complete all the structures on his or her island, including two Great Wonders, wins the game!